We are thrilled to have another guest review to share with our readers today! Marina is a good friend of ours who enjoys cupcakes (just like the rest of us) and has been nice enough to take photos from a recent trip she took to Georgia. Thanks Marina! I love to travel and I also love desserts. On my most recent trip to Savannah, GA I figured why not find a cupcake shop while there to share my review with my Cupcake Crusader friends. Despite the numerous visitors I imagine Savannah has each year, I was having trouble finding cupcakeries. When looking online, I found a few bakeries, but none specified if they had cupcakes. 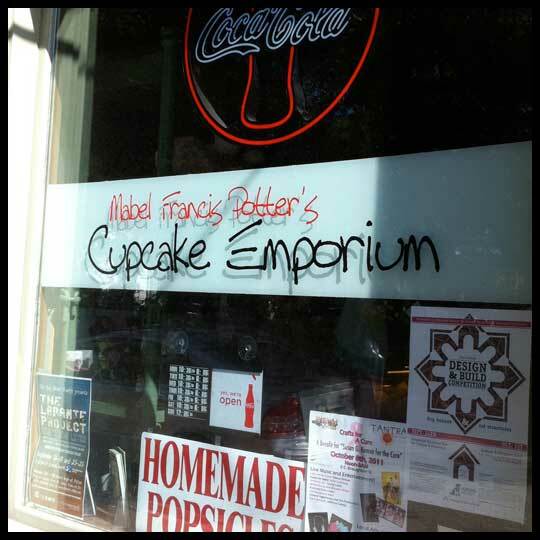 Mabel Francis Potter’s Cupcake Emporium had a few mixed reviews online, so I figured this would be a good place try. After looking up the address, my husband and I arrived at Wright Square (Savannah has 24 squares that it’s kind of known for) and found it quickly because they have a cupcake flag above the door. One thing I like about this place is that on their Facebook page they list their flavors for the day. I have a hard time making decisions when there are so many choices. They had 2 display cases and one held their cookie cupcakes. I’ve never had them so I can’t knock them, but if I’m going to have frosting, I’d rather eat a cupcake/cake and if I want a cookie, I just want a cookie. That said, I knew I would just get regular cupcakes. Since I had red velvet cake at my wedding, I often order red velvet to compare them at various places. I also am a HUGE chocolate peanut butter fan so that is usually my other go to flavor. But, after reading the Cupcake Crusaders blog I decided to venture into different flavors. As you can tell from the photos, the Cupcake Emporium does a nice job with decorating their cupcakes. I like to see consistency in decorations, however, while these were pretty, I am not a fan of having a lot of icing piled on (unless it is a flavor I love, or a whipped cream type of frosting). I decided on 2 cupcakes, The King (named for Elvis’ favorite flavors, banana cupcake with peanut butter frosting) and a Strawberry with buttercream. That night I ate The King cupcake. This was very good. When I opened the cupcake liner I could see the banana like it was fresh banana mashed into the mix and not just some flavoring. The cake was moist and flavorful. 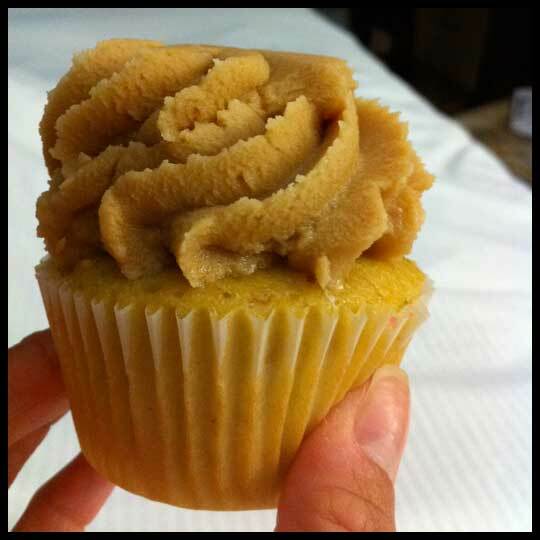 I love peanut butter frosting, and this frosting had a nice peanut butter flavor and was not overly sugary, but it was a little gritty. Since it was gritty with peanut butter I didn’t think it was bad though. I would recommend this one, and I think Elvis would approve. I waited until we got home on Sunday to eat my Strawberry cupcake. I was just too full from all the other foods we ate in Savannah. The strawberry cake was moist with a great flavor even after eating it a day late. Unfortunately with the frosting you could tell it was a day old. It was much crunchier than I would have wanted. I felt this icing was almost too sugary so I could only eat about half of the icing. It was not quite as good as the peanut butter. All in all, I think I am mixed on my review. I would try this again, but probably would pick cupcakes with the more flavorful frosting and not just plain buttercream. They were good, but not so good that I would be asking for a frosting shooter. 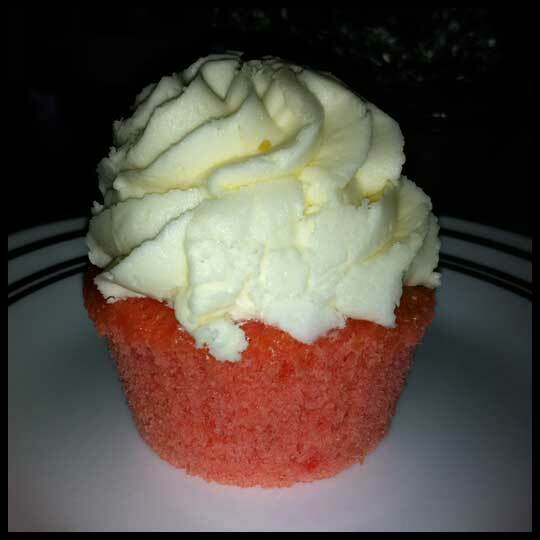 Until my next cupcake adventure…. This entry was posted in Cupcakes, Georgia and tagged banana, Cupcake, Georgia, Mabel Francis Potter's Cupcake Emporium, peanut butter, strawberry by Stacy. Bookmark the permalink. I love Savannah! But I’ve never been to this Cupcake Emporium, I’ll have to try it next time. Hi Jen! 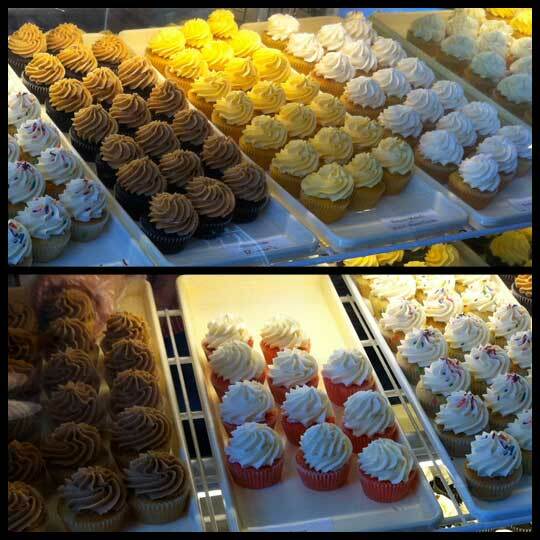 Do you have any recommendations for cupcakeries in Savannah? Marina said she was having trouble finding places to go. If you do have recommendations, we’d love to hear about them! Hi! I’m sorry I didn’t see this earlier. I lived near Savannah before cupcakeries started popping up… but I think I still know some people who live around there if you’d like me to ask them. Hi Jen, If you think of it and would like to ask, that would be great!